Inicio CarreraDIGITAL 124/132 & EvolutionRefaccionesPiezas de RepuestoCarrera 89927 Spare Parts for Mercedes-AMG GT3 "Haribo Racing, No.88"
Carrera 89927 Spare Parts for Mercedes-AMG GT3 "Haribo Racing, No.88"
Votre panier totalisera 4 puntos qui pourront être convertis en bon de réduction pour un prochain achat. 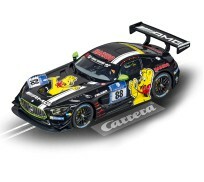 Carrera DIGITAL 132 30782 Mercedes-AMG GT3 "Haribo Racing, No.88"
Haribo - kids and racing drivers love it so! Carrera Evolution 27545 Mercedes-AMG GT3 "Haribo Racing, No.88"